Tonight we had a "poor Addi" moment... one where you would cry for her if you weren't laughing so hard. So, she went to bed and within a few minutes was yelling for us to come get her. OK, that happens a lot. So, we ignored her. The yelling got louder... Still nothing new so we continued to ignore her. Finally Jay headed upstairs to let her out (I was making a yummy five minute microwave chocolate cake, thanks Rachael!) and came downstairs a few minutes later. Addi was crying SO hard that I couldn't understand a word she said but did make out something about a toe (or a nose) hurting. After Jay stopped laughing he recapped for me the scene he came upon when he opened Addi's bedroom door. Addi has a Dora table in her room. 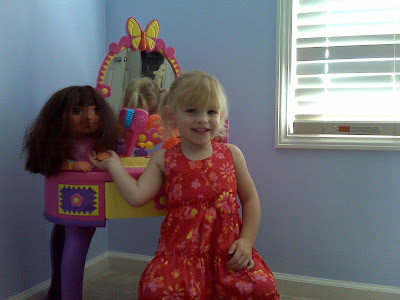 She sits on the little stool and does Dora's hair or just plays. Here's a picture of it from this summer - Dora was her favorite hand-holder until Sam took the job. The stool was on top of one of her toes, and since she was sitting on the stool it apparently hurt pretty bad. And she couldn't figure out how to get up. So, she was totally stuck. Sitting on her own toe. In pain. You just gotta hug her. Although, I would have laughed too.